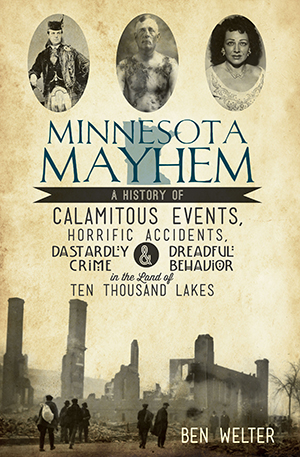 Turn back the yellowing pages of Minnesota's past and explore the best of the state's worst moments, as chronicled in the Minneapolis Tribune and its successor newspapers. These stories and photos, culled from the Star Tribune's microfilm archive by author Ben Welter, range from the catastrophic to the merely curious. From a fire that destroyed the State Capitol in 1881, to a wordless fistfight that broke out on a Minneapolis street in 1898, a flu outbreak that killed more than 10,000 Minnesotans in 1918 and the arrest of Frank Lloyd Wright at a Lake Minnetonka cottage in 1926. Ben Welter, news copy chief at the Star Tribune newspaper, is a Minneapolis native and a graduate of the University of Minnesota. At work, he edits stories and writes headlines and photo captions. In his free time, he fishes for bluegills, rides a mountain bike and plays hockey and Scrabble. His history blog, "Yesterday's News," features stories and photos culled from the Minneapolis newspaper's 145-year-old microfilm archive. To avoid dating himself, he established one rule at the blog's launch in 2005: stories published during his own lengthy newspaper career do not qualify as "Yesterday's News." He has broken that rule just once, posting an account of Twins legend Kirby Puckett's exhausting first day in the Big Leagues in May 1984.